Imagine spending several hours outdoors with the mercury rising to 100 degrees Fahrenheit. Aside from looking for a shaded place to rest, perhaps the next thing on your mind would be to grab a cold drink. This is where a camping cooler can come in handy. Able to keep ice and drinks cold for hours, a camping cooler is obviously a must-have for any outdoor enthusiast. The best camping coolers do not only keep your drinks cold or hold ice to prevent your meats and vegetables from spoiling; many modern coolers come with accessories, such as convenient bottle openers and cup holders. Others are strong and versatile enough for you to use their tops as an outdoor seat. To find exactly what you need, check out our list of the top 18 camping coolers. Then, if you need a little more information, keep reading to see our tips for what to look for in picking out a camping cooler. This 35-quart ice chest is tough, durable, and can retain ice for 5 to 14 days. It has recessed latches and handles designed to make loading and unloading from a truck easy. Its shell is constructed from heavy-duty polyethylene, which gives it great durability and toughness. The insulation is top-notch, with pressure-injected HUNTX foam made in Alabama. The foam is almost an inch thick and, with the air-tight seal, retains ice for many days. There is also a drain plug located at the side of the cooler. The unit measures 15.5 x 23.75 x 16.75 inches, with the interior measuring 17.9 x 9.7 x 12.5 inches. When empty, it weighs around 20 pounds. It also features rubber feet to keep it from sliding when in transit. This 48-quart performance cooler from Coleman can keep your drinks and foods cold for 2-3 days. The cooler is large enough to hold up to 63 cans of your favorite beverage. There’s also enough headroom for storing 2-liter bottles upright. It has two-way handles that make transport a lot easier while the leak-resistant drain should help in emptying excess water easily. The cooler, which measures 14 inches wide, 14.5 inches tall, and 26 inches long, is ideal for light to medium-duty use. Coleman also used its Thermozone insulation technology for this cooler. The walls do a good job of insulating the cooler and keeping internal temperatures low. The handles automatically slide down for convenient storage. 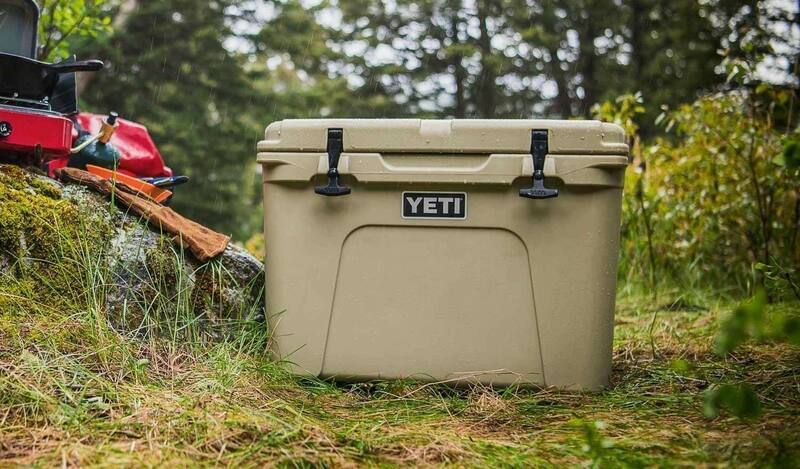 Yeti is a respected brand, so you can expect this 45-quart cooler to be of good quality. It is built well and should be able to endure years of use. It has extra-thick walls to retain ice for days while its roto-molded construction makes it virtually indestructible. The cooler measures 25.5 inches long, 16 inches wide, and 15.5 inches high. When empty, its weight is around 23 pounds. With a capacity of 45 quarts, this cooler should be able to accommodate up to 26 cans following the recommended ice-to-contents ratio of 2:1. You can count on this cooler to keep your foods and drinks cold for a long time thanks to its permafrost insulation. Aside from the thick walls, the unit has polyurethane foam in the walls and lids to keep the temperatures low inside. Securing it in the back of a truck or even on top of a car will not be a hassle at all because it comes with anchor point tie-down slots. The vortex drain system is rugged and leak-proof for quick and easy draining. Igloo is yet another brand that many people have long associated with coolers. This 100-quart cooler is a prime example of why the brand is highly respected. With that capacity, it can hold more than 140 and keep two 2-liter bottles upright. This cooler is capable of holding ice for more than 5 days thanks to its ultra-therm insulated body and lid. The liner is stain and odor-resistant to keep food and beverages fresh. It measures 35 x 18 x 17 inches and is surprisingly light at around 20 pounds. It has a quick access hatch that should let you get your food or drinks without letting the cold air escape. Meanwhile, the handles swing up and, with loops, can easily be tied down in the bed of the truck so that it won’t slide. The drain plug is threaded so that you can connect it to a hose for quick and easy draining. This model has a classic look that should remind you of the coolers of yesteryears. The Coleman 54-quart steel belted cooler has the classic design first used in 1954. It has enough capacity to hold up to 85 cans, and it also has enough headroom to accommodate 2-liter bottles. Coleman is known for its advanced insulation technology, and this cooler is proof of it. This steel-belted portable cooler can keep ice for 4 days, even when exposed to temperatures of 90 degrees Fahrenheit. This Coleman portable cooler may have a classic look, but it is designed and built like most modern coolers. It has comfort-grip steel handles that make carrying it a less daunting task, and the stainless steel lid latch keeps it secure. The lid itself is tough and strong enough to be used as a seat around the campfire. Measuring 26 x 17 x 17 inches, the cooler weighs 19 pounds. There is a leak-resistant drain that you can for emptying the water without having to tilt the cooler. If you’re looking for a less expensive alternative to coolers from more recognizable brand names, then include this Outsunny portable camping cooler on your list. Offering 32 quarts of storage space, it can be a practical option if you only go on 1-2 day camping trips. Its 2-inch thick insulation is enough to hold ice and keep drinks and foods cold. Moreover, the gasket is similar to those used in freezers and runs the entire length of the lid. This further prevents cold air from escaping the cooler. This cooler has a roto-molded construction, making it indestructible and capable of withstanding years of use and abuse. The durable handles are made with nylon material for superior grip. The reinforced locking latches secure the contents of the cooler, while the drain is leak-proof, and the non-slip feet prevent the cooler from sliding around as you drive. This 65-quart cooler is ideal for groups and families who love to go on extended camping trips. Not only does it have a large capacity to hold many items, but it is also capable of retaining ice for an amazing 16 days. Plus, it has different integrated accessories that make it such a valuable companion outdoors. At the heart of the OtterBox Venture Cooler is its 2-inch refrigeration-grade foam core. It is designed to retain ice for up to 16 days, making it a great choice for people who like long camping stays. It is also bear-resistant with its tough latches that are impossible for grizzlies to open. The cooler is ultra-durable, and its handles can survive years of abuse. The 65-quart capacity is enough to accommodate 36 cans, 69 boxes of juice, and up to 75 pounds of ice. It measures 40 inches long, 18 inches wide, and 19 inches tall. Moreover, this cooler features a bottle opener and a dry storage tray. This is one camping cooler that gives you value for your money. A 70-quart cooler, the Coleman Xtreme portable cooler can keep your foods and drinks ice-cold for as many as 5 days thanks to its advanced insulation. It also has other noteworthy features that make it a good choice if you are shopping for a reasonably priced cooler. This cooler measures 23 x 17 x 17.5 inches, and it weighs 12 pounds. The lid is tough enough to accommodate a 250-pound person who sits on it. Cleaning it should be a breeze with its smooth texture and EZ-clean lid. The handles are well-built. These are easy to grip so that you can lift the cooler in and out of a vehicle easily. There are also built-in cup holders molded into the lid where you can place drinks to avoid spills. This 25-quart cooler from Igloo is best suited for small groups and even individuals who love to camp. It can hold ice for up to 4 days. Its blow-molded construction and reinforced base give it the strength and protection to last for years. It’s available in two colors, blue and black. This cooler is versatile as you can also use it for picnics, backyard parties, and fishing trips aside from camping. It is capable of holding ice for up to 7 days. Built like a tank, it is capable of delivering quality performance for many years. It is also easy to clean. Made of roto-molded polyethylene, this cooler is tough and rough. It measures 24 x 13 x 15 inches. It weighs about 17 pounds. It has a silicone seal that gives it an airtight seal, preventing cold air from escaping and keeping the contents cold for 5 to 7 days. It is also very easy to clean. The interior of the cooler is made of nontoxic material that won’t affect the taste or smell of the food or drinks stored inside. There is also a nylon handle that is designed for convenient and easy handling of the cooler. The rubber feet, meanwhile, secure the cooler and prevent it from sliding. This cooler has qualities similar to the other Coleman coolers we reviewed save for a couple of intriguing features: its locking telescoping handles that make it easier to pull the cooler when it is full and the heavy-duty 8-inch wheels that allow this unit to be rolled over any rough terrain. These two features make this 55-quart rugged wheeled cooler very appropriate for camping trips. There are easy-to-lift swing handles that you can use if you want to carry the cooler. Of course, count on this cooler to keep your foods and drinks cold. Its insulation can keep ice for up to 5 days in temperatures as high as 90 degrees Fahrenheit. The lid keeps cold ice inside, while a tie-down system prevents it from sliding when the vehicle is moving. There is also a leak-resistant drain that should make it easier to empty excess water. Plus, it has cup holders, too. This Coleman cooler measures 22 x 17.6 x 17.5 inches. It weighs 12 pounds. This is similar to the preceding cooler as it has wheels for convenient transport. This Coleman cooler is spacious enough to carry 95 cans. You can expect superior insulation with this Coleman cooler as well. Measuring 29 x 15.5 x 20 inches and weighing around 16 pounds, this cooler has two-way handles for easy lifting in and out of your vehicle. The lid is tough enough to serve as a seat while there are also cup holders molded into it. This cooler features an insulated lid and thick walls to keep items cold for 5 days. Once the fun is done, you can quickly empty excess water through the leak-resistant drain. This is a good choice if you are looking for a value for money cooler. It is durable and lightweight, and it has enough room for close to 100 cans, while the T-grip latches keep its lid secure. As you would expect from an Igloo cooler, this 52-quart model is built like a tank. It is blow-molded for increased strength and protection, and its base is also reinforced. Despite its heavy-duty construction, it is relatively lightweight at 16 pounds. It measures 26.6 x 16. 9 x 16.9 inches. This cooler can keep ice for up to 5 days. The interior is designed to be up to 20% thicker, and its lid is well-insulated to retain ice for a long time. The stainless steel hinge rods are rust-resistant and should remain useful for years. This mid-sized cooler from RTIC is durable and impact-resistant. It is also versatile enough to be used as a bench, a step stool, and even a cutting board. And it does a great job of retaining ice even when exposed to high temperatures. The cooler has a roto-molded construction, giving it the toughness and durability to last for years. Foods and drinks are secured by the heavy-duty T-latches, and the insulated walls are up to three inches thick to keep the contents cold for days. This bear-resistant cooler has non-slip feet and an integrated locking system. The V-drain system, meanwhile, facilitates quick and convenient emptying, and the molded side handles are there for convenient carrying and lifting in and out of a vehicle. REYLEO is not the most well-known brand, but it does create high-quality coolers like this one. It is tough and durable, capable of retaining ice for up to 5 days. This may not have the biggest capacity, but the cooler should be good enough for a weekend camping trip of a small family. To give you an idea, this cooler has room for 30 cans and is capable of retaining ice for 3 to 5 days. Measuring 18.3 x 13.8 x 13.4 inches and weighing about 17 pounds, this cooler is lightweight and easy to store. It features an easy and secure latching system that creates an airtight seal. The rubberized feet, meanwhile, ensure that this cooler won’t slide easily. You will also love the stainless handle of the cooler as it has a soft pad designed for convenient and comfortable carrying. This Igloo cooler is made from a polyethylene material, which is known for being ultra-durable. Its insulated body can keep foods and drinks cold for several days. The most prominent feature of this cooler is its push-button and locking telescopic handle. Plus, there are durable wheels that can handle even the most punishing terrain. There is also a molded side scoop handle for quick and easy loading and unloading. Igloo designed this cooler in such a way that transport and carrying it won’t be a hassle at all. This cooler measures 20 x 18.5 x 20.69 inches. Here’s a camping cooler that you will want to have during an extended stay outdoors. With a 75-quart capacity, the Driftsun cooler can accommodate enough drinks and food for many days of camping. Its superior insulation and wide freezer gasket are critical in keeping cold air in. It has non-slip rubberized feet that prevent the cooler from moving around. The lid is also self-stopping, meaning you can search for whatever item you need inside the cooler without having to hold the lid. Rubbermaid is a good and reputable brand, and this 75-quart cooler is a steal given its reasonable price. This cooler has the capacity to store up to 130 cans and ice. That’s enough room for your provisions for a week. Making this cooler an even more attractive option are the large, rugged wheels designed to make transport easier, especially on rugged terrain. The handle is made of durable metal, while there is a drain for quick and convenient emptying. The side swing handles help you lift this cooler in and out of the vehicle. This cooler measures 16.9 x 33.3 x 19.4 inches and weighs about 15 pounds. There are also built-in cup holders that can accommodate 12 and 20-ounce bottles or cans. Without a doubt, this is the top consideration in choosing a camping cooler. The better the insulation is, the longer your foods and drinks will be kept cool inside the chest. Light coolers are normally capable of keeping temperatures below 40 degrees Fahrenheit for around 2-3 days, making them a great choice for families who want to go on a weekend camping trip. If you spend more than a week outdoors, then you might want to use dry ice instead. The seal is important in keeping the temperature inside the cooler below ideal levels. To put it simply, a good sealing mechanism keeps cold air in while preventing the hot air outside from entering the cooler and causing the ice to melt. For some people, the size of a cooler is the deciding factor in buying this all-important piece of camping gear. When determining the size of a cooler that’s best for you, take into account the space you have in the trunk of your vehicle. Suffice it to say, find a cooler that won’t take up a lot of real estate in your vehicle. Of course, you also have to consider the amount of food and drinks you typically bring during a camping trip. This is not a minor factor at all because handles can make it easier for you to move a cooler filled with ice, water, food, and drinks. Avoid getting a camping cooler with cheap handles as they will likely break eventually. Instead, find a cooler with robust and comfortable handles that can stand up to years of use and abuse. As the ice melts, your cooler will eventually be filled with water, so you want one that has a built-in drain to make draining the water a breeze. Find one with a drain plug that is receded inside the cooler’s body so that it won’t be broken or knocked loose by accident.